Yoda's News posted images of these sets - one set packaged and loose and the other only loose. 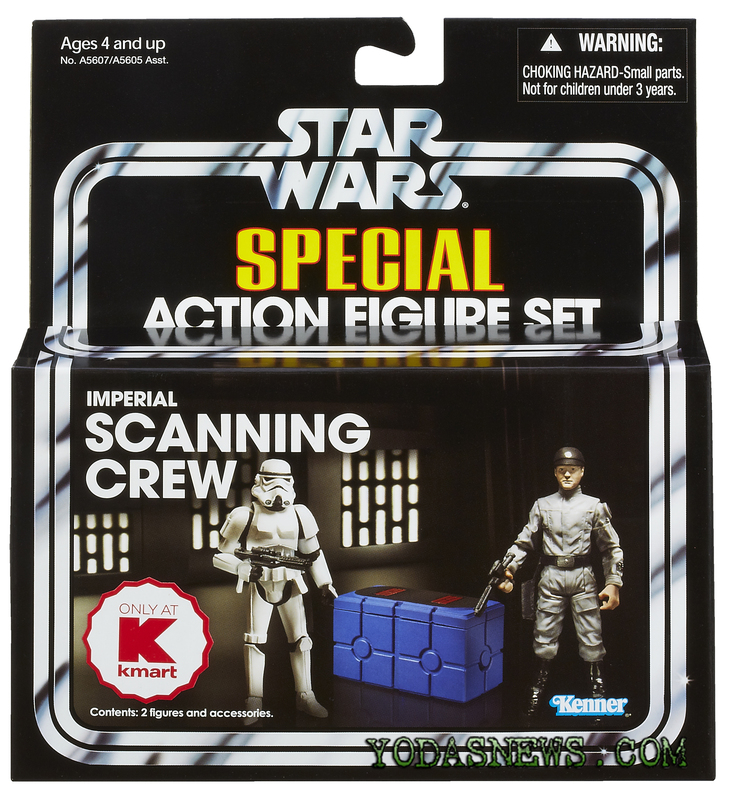 The first set comes with the repacked scanning crew member and a stormtrooper and the second comes with the unreleased scanning crew member and an Imperial officer (a black-suited repaint of Needa with a new head). It looks like they packed the equipment with the opposite figure it was supposed to ship with initially, a pretty sneaky way to get people to rebuy the existing figure. I was initially excited by these, but now I'm kind feeling a bit "meh" about them. I don't really need more stormtroopers and I wish they would've used an officer sculpt with better knees on it and in different colors. I'm sure I'll end up buying at least a few. I got both sets a few days ago. The original photography was misleading - the Imperial Scanning Crew includes the previously-unreleased Imperial Technician, the previously-unreleased scanning equipment, and Stormtrooper TK-421; Death Star Scanning Crew includes the 2009 figure, the 2009 scanning accessory, and a black-suited Imperial Officer. TK-421, which is I believe the first individually named Stormtrooper figure, is modified from the OTC sculpt. Instead of a detonator, the belt has the grappling hook box and a removable, incredibly small white comlink and its holster. This is the trooper whose armor Luke steals, so hopefully they'll include the belt on a future Stormtrooper Luke release. The Imperial Officer is a repaint of Captain Needa with a new head, and I believe the first black-suited officer in this mold. It could have used a more updated sculpt, like Tarkin or the Imperial Navy Commander, but the figure still works fine. I'm not sure if he's based on a specific officer from the film, and a lack of good internet connectivity prevents me from researching to my full ability (for at least a little while ). The "new" accessory fits right in top of the other one, and also opens to reveal sculpted detail and removable equipment. It's pretty cool. Unfortunately, the paint on some of the figures is quite misaligned, particularly around sideburns. And since the figures are packed out of sight, you don't really have a choice. But the sets are still very much worth it. Thanks to Chuxter, I got both of these sets. 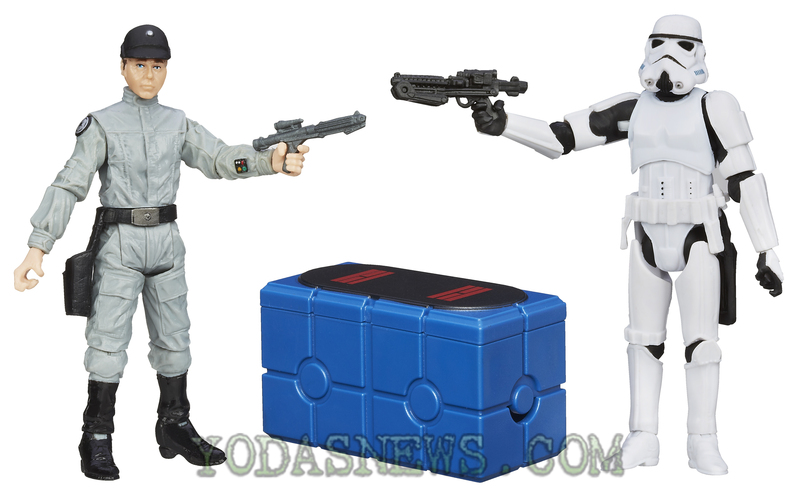 There's the new E-11 Stormtrooper blaster, it's got a sharp sculpt and a fold-out stock. There's one in each set, and both are packed with the stock not actually attached at its hinge point. It works well and looks alright, but there is a notable amount of bulk as well so it's not perfect. The stormtrooper, TK-421, has probably the smallest accessory ever, and it will likely get lost quickly but it fits well in the hand. This figure's belt is indeed seen in the film before his armor is stolen by Luke, whereas the rest of the troopers all have the standard armor, it's pretty slick that the film is accurate there. The left hand on mine was fused with a glop of flash, it's so small I'm not sure I can carve it out, but I may have a tiny drillbit that could auger it out if I really need to. The figure's belt is a very nice addition and makes this worthwhile. Unfortunately, its helmet sculpt is very dated now and feels somewhat out of place, so it's a tradeoff. The belt's holster won't hold the included blaster because it's the new one, and the tech's holster surely wouldn't and would look weirder without a gun in it. The Imperial Technician is nice to have, new faces are good, but we already have the body so I'm not freaking out over it. The tech's scanning equipment box is the star of the show, it's got a removable lid, a hand-held accessory that snaps into the main tray, a scanner gun on a hose that also plugs into the tray, and the tray itself can be popped out the bottom to get stuff aligned. If that weren't enough, the scanner box even has 2 cutouts for the figures' hands to carry it just like in the film, although keep in mind the cutouts are a wee bit small so hands will get stuck in there and have to be removed a little carefully. That set is superior in every way to the other. The black-suited officer of the other set comes with the new E-11 accessory. The figure appears to be representing Lt. Pol Treidum, the officer who was calling out to TK-421 when Chewbacca whomped him in docking control room 327, killing him dead. The face is longer than the movie character but there is some similarity with the broad nostrils and long sideburns, The removable hat makes this figure more interesting than without. The body feels like a throwback, and it's considerably taller than the others. Mine has a mispainted eyebrow giving a quizzical expression, and had joint lock on the hip but a quick hot water bath followed by an overnight cooldown fixed it nicely. The scanning tech is a rehash of the '09 release with the same head and accessory in the scanning cart. This cart rolls nicer and has much more accurate paint, and it fits the scanning box from the other set quite nicely. It's not a bad piece to get at this price for an exclusive. I'd recommend this set as much as an army-builder for non-armored Imperial forces as a companion to the other set, but it's clearly not as good. So uh... how did 3PO and R2 get into the smuggling compartments? I think these sets are by far the best thing Hasbro has put out this year. I got my first sets last week and plan on buying several more as I find them to have more random imperials. Another great point is the price which seems quite reasonable for what you get. I'd love to see Kmart get a tturbo laser with a gunner next year similar to the one that came in the original Death Star play set. I'd buy several of those. You saw them... out of the trunk of some scalper guy in a Target parking lot! I understand the same jackhole had a Mo-Larr, too, and had the nerve to sell those things at cost! Found one of each of these at K-Mart on Wednesday, but no luck finding the Ewok set. I was able to check a couple more times this week, but still nothing more. Snagged a few of each trooper set, plus I got an ewok set for myself and my brother. They had plenty of all of them and they were all in perfect condition. There aren't many KMs around here no more, and whenever I check for 'em, there ain't none. Oh well. Mebbe they'll be on sale sometime. I can live without. Some sites have scans of Black Friday ads, and I believe these are all in K-Marts. Which, given how s***ty K-Mart is run, means that a third of K-Marts will put them out two weeks earlier and they'll be gone, a third will sit on them until mid-December, and the final third will have a staff scalper who takes them to Frank & Sons. In the words of Robotology: That equals truth! Funny you should mention that. The KM I got mine at already had them at Black Friday price. Finally found one (actually they had two) of the sets at the only Kmart within a reasonable distance. Unfortunately, it was the one with the scanning box piece we've already seen so I got it, but I'm not nearly as excited about it as I am about the other set. Hopefully, these will keep rolling in instead of just being a one case per store type deal.